Last January, In-plant Graphics Magazine, a publication dedicated to in-plant printing services, highlighted the work of Metro’s Office Services department and its efforts to combine upgrading equipment and capabilities with more in-house printing services to cut costs. How much has the effort saved? “I’ve been able to reduce our operational budget from $475,000 to $210,000 without increasing staff [of five],” Director of IT Quality and Office Services Kent Swagler told the magazine. In case you’re not a math fan, that’s a 56 percent decrease in operational costs in five years. At the same time, Office Services actually increased the amount of work they can do in-house. Metro can now produce about 90 percent of its printing jobs in-house. Utilizing printers with more finishing features, such as perfect binding, folding, saddle stitching, etc. That means things like the annual report and training books can be made in-house. A big money saver has also been a waste saver: reducing the amount of paper the Agency uses. 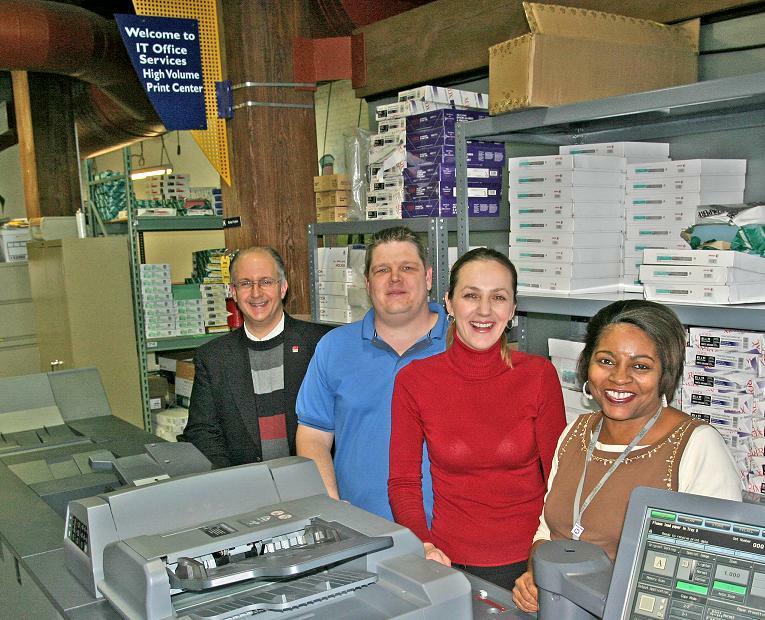 Swagler converted many of Metro’s copiers into scan-and-copy systems, so that more forms could be sent electronically. Now his department is reviewing forms to see how they can be converted to electronic forms or reformatted to take up less space on a sheet of paper. Since 2004, they’ve reduced usage of letter paper from 2,600 cases to only 800, and they’re still aiming to use less. If saving money, time, and trees isn’t exciting enough for you, how about catching a mail thief? In early 2008, Metro found out that a couple of vendor sites were not receiving their weekly and monthly passes. So Office Services and the Transit Passenger Revenue departments contacted the United States Postal Service-Office of Inspector General (USPS-OIG). Foul play was suspected, so they worked together to track down the thief. In August 2008, the thief, a postal truck driver, was caught in the act, throwing envelopes against the wall to break them open. 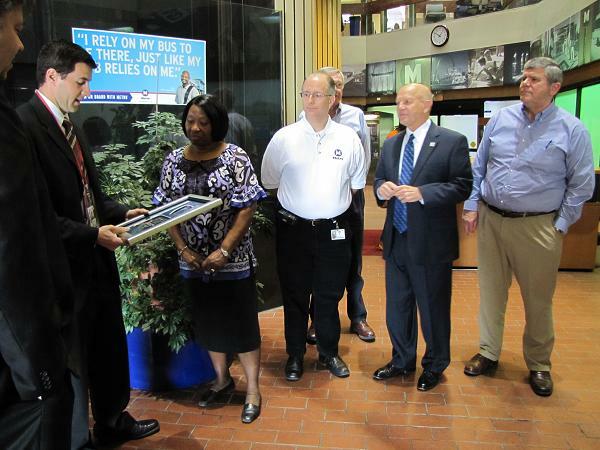 This year, USPS-OIG presented Metro’s Transit Passenger Revenue Department with an award for assisting them with the investigation. And the envelopes the passes are shipped in? They are now made from a stronger polyester blend and reinforced with packing tape. Printing and office services may not seem like they affect riders, but one department’s effort to be more efficient may save a job in another. High-five Office Services and Passenger Revenue! Has your department or company made changes that meant big savings? Do you have interesting ways to recognize these efforts and employees? Let us know. I haven’t heard anything recently regarding additional service restoration or enhancements. Is there anything currently cooking in that department? Metro had reported earlier this spring, shortly after the passage of Prop A., that there was going to be 3 phases of restorations before this year’s end. Originally there were 3 phases, but they decided to combine Phase 2 and 3 into one large restoration in August. Any changes made now are adjustments deemed necessary after the second phase had some time to settle into routine. I see that they are going ahead and having mainly young employees work. I am glad to see that there are older people working at Metro, but why go and throw away tax payer money by turning away older workers that apply for work at Metro? That’s stupid. The train cars have only foot controlers for the brake and throttle. 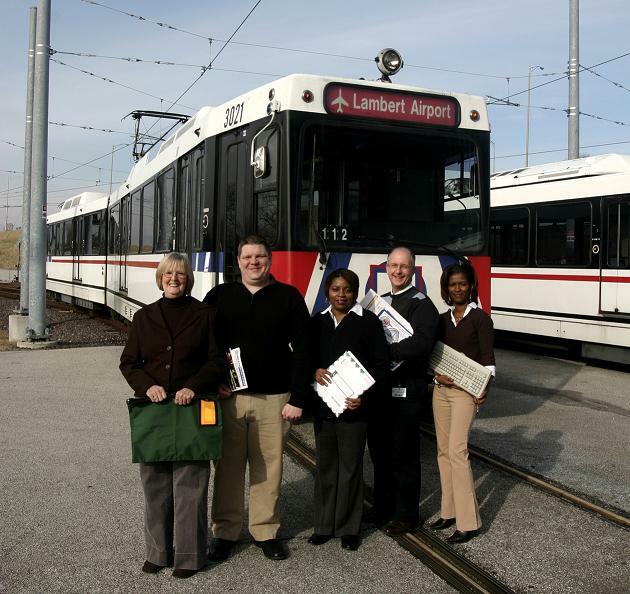 Thus making it impossible for wheelchair bound people to become MetroLink train operators. I thought that Metro is not allowed to discriminate in any shape or form. But I guess when it comes to older workers or handicapped workers, some departments have special authority to discriminate against the handicapped. If there is a maximum age limit in some departments at Metro being set in the mid to upper 20s, then that age limit needs to be elevated to the upper 90s so senior citizens that want to work at Metro in any department they want, they have the opertunity. Best Buy got slapped with an $8,000,000.00 fine for age discrimination. I know that the staff is doing great. I do see older employees at Metro in some of these pictures. That’s great. Many of them grew up in the days when we still had streetcars. I’ve seen the older drivers handle driving these buses like a pro. They remember the times when it came to driving the buses, you had to shift on some of them. And back then, you didn’t have power steering. It is not that I want to get rid of the young workers, but I want to make sure that our seniors and our handicapped don’t ever get denied a chance to work at Metro. I know that Metro cannot afford an eight million dollar fine for stupidity. That eight million dollars is needed for expansion work. I think that the next cars we buy for MetroLink should have hand operated throttles so that if a handicapped person wants to become a MetroLink train operator, they would have that advantage. Plus for the buses, we need to install levers below the steering wheel so that they too could be handicapped friendly for if somone that is wheelchair bound wants to be a bus driver. I know both moves would be costly, but with the Prop A tax passage, we should be able to accompany that. The first electric streetcars we had were hand-operated. I posted some pictures taken with my old cell phone before it got stolen. And the pictures were windshield shots of the #110 Affton shuttle. I hope more runs gets put onto the line due to that it’s the only line that serves Grant’s farm. And I would love to see the #56 run on Sundays because it serves a lot of churches. Somone told me at my church a while back if there was enough service available on Sundays that they would ride Metro to church. Gillig Corporation isn’t Gillig Corporation without the employees that work there. And God is the creator who created those employees. Parking lots at these churches are filled to capacity and if we provide Sunday service on the #56, we could open a few parking spaces at these churches.